Aug. 26, 2014 - The world’s biggest wood-product producers and consumers are North America, Europe, Japan and China, and these markets constantly face fluctuations in both demand and supply. These markets (and others) as well as their key demand issues were discussed at length at WOOD MARKETS’ 2014 Global Softwood Log and Lumber Conference held on May 7th in Vancouver. The following is an extract from selected conference presentations as they provide some excellent perspectives about the key trends and drivers for the rest of 2014 and beyond. China remains a huge player in global softwood markets and continues to impact both imports and exports. The country’s housing construction and property markets continue to be enigmas to western forecasters: will the current market slowdown snowball into a crash, or will prices have a minor correction and property markets quickly stabilize? Just as China has become dependent on softwood log and lumber imports to feed its booming industry, so too have log and lumber exporters become dependent on China to efficiently manage and/or absorb their shipments. Thus, any slowdown in the Chinese economic machine can cause major ripples throughout the global and North American wood industry as inventories build or prices correct. Henry Lin of Superchain Logistics (China) provided his perspective as a Chinese log importer. As China has become dependent on increasing volumes of imported logs to feed its booming construction industry, several log-exporting nations have become more dependent — almost too dependent — on China as a major market. Mr. Lin’s claim is that global log export prices and currency exchange-rate fluctuations have fostered a “trader mentality” among many exporters to China, without proper analysis of market demand or inventory levels. This, in turn, has led to oversupply and inventory imbalances in China. A dip in log inventory levels last December was one of the causes of the recent price spike up to the end of Q1/2014. Higher prices caused a flood of log shipments to China, and, coupled with a contraction in construction activity, led to a subsequent price correction that started in April (and continued to the end of June). Mr. Lin stressed that wide fluctuations make it very difficult for log and lumber importers, as they tend to operate on slim margins and are exposed to the most market and currency risk. Both Henry Lin and Tolko’s export sales manager, John Langley, discussed in detail the recent, steep drop in the Chinese construction industry. Tightening credit conditions have left property developers short of cash, the effects of which have rippled up and down the supply chain. Developers have asked material suppliers for 90- to 180-day (or longer) payment terms; this has left wholesalers short of cash with which to purchase additional inventory from importers. Working backward up the supply chain, this has aggravated the glut of log and lumber inventory levels at ports and caused a drop in log/lumber prices and inventory values. In fact, log inventories in April had doubled from the end of 2013, and lumber inventories were at elevated levels despite the Vancouver port strike. China’s real estate market is considered by many to be overbuilt, and Mr. Langley forecasts a slowdown from the previous growth rates of around 20 per cent to flat to or even negative growth over the next three to four years as a result of flatter demand. This could result in a three to four per cent decrease in total consumption (on a roundwood equivalent basis) in 2014 versus 2013. (Other speakers, however, were more bullish with their outlook on China). “Abenomics,” the Japanese housing market, and Japan’s own forest industry were key themes discussed by Shawn Lawlor, director of Canada Wood’s Japan office. A blend of fiscal stimulus, quantitative easing, and structural reforms have been implemented to “jumpstart” the Japanese economy. However, after a six-month growth spurt in 2013, GDP growth has now slowed. Housing starts rose by six per cent in 2012 and a further 11 per cent in 2013 in anticipation of the consumption tax increase that took effect on April 1, 2014; starts are forecast to decline by ten to 15 per cent this year. While the impact of the new tax is expected to result in a three to four per cent GDP contraction in the April–June quarter, analysts are not predicting a recession (or housing crash) such as the one that occurred in 1997 (when a similar tax hike was implemented). In particular, a shortage of construction labour has ensured that real estate markets have not become overbuilt. Going forward, household formations are anticipated to be flat until about 2020. However, the overall population is in decline and a surge of “dankai juniors” (the Japanese equivalent of “echo boomers”) are entering their prime home-buying years – this should prop up demand. The Tohoku reconstruction will need to rehouse the approximately 200,000 people still living in temporary housing; however, this will represent only about five per cent of the total Japanese construction market over the next five to six years. Expanding the demand for wood products is an important issue for Japanese policymakers. In addition to implementing the Wood Points Program (discussed in last month’s Wood Markets report), the Japanese Forestry Agency has promoted work on building codes to allow more wood to be used in institutional applications – for example, in elder care homes. The goal is to grow non-residential wood use to about 30 per cent of the total market (a jump of 2.5 million m3). However, Mr. Lawlor indicated that this may be overly optimistic. North America continues to be a huge consumer and producer of softwood logs and lumber. Forest economist Bruce Glass of Campbell Global (USA) presented an overview of North American softwood lumber supply and demand issues. On the demand side, the future is positive. U.S. household balance sheets (debt payments as a proportion of disposable income) have recovered, lenders are gradually loosening the purse strings, housing affordability remains high, and pent-up demand is growing. All of this means that lumber demand is expected to return to pre-recession levels, perhaps within the next two to four years. These comments were echoed by the author and also by Wayne Guthrie, senior vice president of sales and marketing for Canfor. Both forecasted higher U.S. housing starts, strong lumber consumption, and rising lumber prices. However, the two concurred that the pace of the recovery may not be as strong as previously thought, due mainly to the potential for subdued levels of single-family housing starts. Mr. Guthrie was enthusiastic about the future for North American lumber producers. While the pace of new housing construction has stalled (at least temporarily), repair and remodelling growth is expected to grow at double-digit rates due to recovering home equity and pent-up demand. Expanded uses for lumber, such as six-storey wood-frame construction for apartment buildings, and multi-storey construction with cross-laminated timber panels, are examples of the opportunities that have arisen from market and product innovation. Mr. Guthrie commented that to feed the projected growth in U.S. demand, massive lumber production growth in the U.S. South (+6 billion bf by 2018, or 40% from 2013) and West (+6 billion bf, or 48%) will be required. In contrast, only slight growth in exports to the U.S. from B.C. and the Prairie provinces is forecast. With reduced output anticipated from B.C., its overseas exports are forecast to decline by 0.7 billion board feet (13 per cent). Complicating North American demand are the emerging declines in the log and lumber supply from Canada that are set to emerge over the next few years, just as global demand accelerates. The author provided a strategic review of the issues leading to a potential global softwood supply shortage. Vast swaths of British Columbia’s Interior forests have now been killed by the mountain pine beetle (MPB), and the dry, brittle logs are nearing the end of their economically viable harvest (shelf life). In Ontario and Quebec, AACs have been reduced for environmental and government policy reasons. Recent U.S. harvests have been well below the forest’s sustainable capacity, but the speed at which the industry recovers will be limited by a fragile supply chain (from the stump all the way to homebuilders). Bruce Glass of Campbell Global further discussed the recovery of the U.S. forest industry in detail. While overseas log exports absorbed most of the “excess” log volume in the U.S. West, southern logs were significantly undercut during the recessionary years (about 32% of the potential harvest volume was left standing, creating a surplus of mature timber). With the mid-1980s’ forest plantings coming online in the near future, this means there is room for a substantial increase in harvest levels. However, more investment is needed — both in logging equipment and in the number of expanded or new sawmills — before lumber production can grow to match the potential surge in U.S. demand. European wood markets are also gradually getting back on their feet. Måns Johansson, managing director of VIDA Wood, Sweden, gave an overview of the log supply and pricing situation in Sweden, Finland, the Baltic States, the U.K., Central Europe and France. Log availability is currently adequate in most countries but log prices are generally high across the continent. While domestic softwood markets in Europe are still well below pre-recession levels, lumber exports have increased. The Middle East/North Africa region, Egypt in particular, is the largest recipient of European softwood exports, and prices have held steady despite that area’s geopolitical uncertainty. The year 2013 saw European softwood lumber exports to China nearly triple that of 2012, and exports to Japan grew by about 30%. Exports to the U.S. are still weak, simply because better prices can be obtained elsewhere. Mr. Johansson suggested that U.S. lumber prices will need to reach ~US$550/Mbf (delivered U.S. East Coast) before the market will attract significant volumes of European lumber. With U.S. South 2X4 prices closer to US$430-450/Mbf as of mid-June, there is still a very wide price gap! While the potential for log supply shortages is the most significant mid-term issue facing parts of the logging and sawmilling industry, there is no shortage of pressing short-term demand issues, challenges and/or opportunities. Global softwood log and lumber exporters are temporarily scaling back exports to China and anxiously watching the status of Chinese property and construction markets. Similarly, producers in Europe and North America are simultaneously watching export and domestic markets for signs of change where U.S. housing starts continue to underperform all expectations. Russell E. Taylor is the President of the International WOOD MARKETS Group based in Vancouver, B.C. 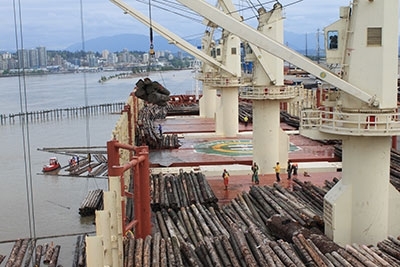 This article was summarized from WOOD Markets Monthly International Report (June 2014) and WOOD MARKETS’ 4th Annual Global Softwood Log & Lumber Conference, held on May 7, 2014, in Vancouver B.C. International WOOD MARKETS Group Inc. is Canada’s largest wood products consulting firm. Its consulting team has provided industry and market expertise in the solid wood products field to its clients since 1993. The company provides market research, new business development, business plan/strategy as well as other consultative services to wood product companies in North America and around the world. The firm also publishes a number of strategic industry multi-client reports including its landmark WOOD Markets Monthly International Report (since 1996) and monthly China Bulletin. Further information is available on www.woodmarkets.com.